By now we’re learning that baking with sourdough is a responsive, reciprocal process. 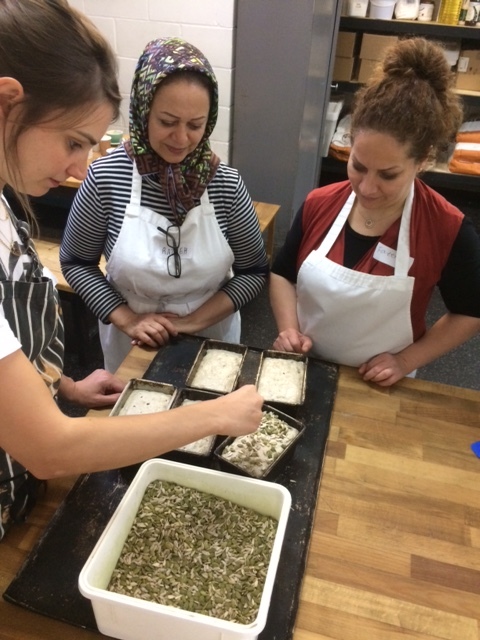 It’s about learning through touch, checking the bread with a light press of the fingers at every stage of the process, smelling the dough, tasting the mixture to see if it’s ready. This is not an academic exercise. Today we’re practicing spelt and rye loaves, each of these will appear as one of the weekly loaves in the five week Just Bread subscription offering starting on 7th November. The recipe for spelt sourdough begins with a spelt porridge, much like a breakfast oat porridge. 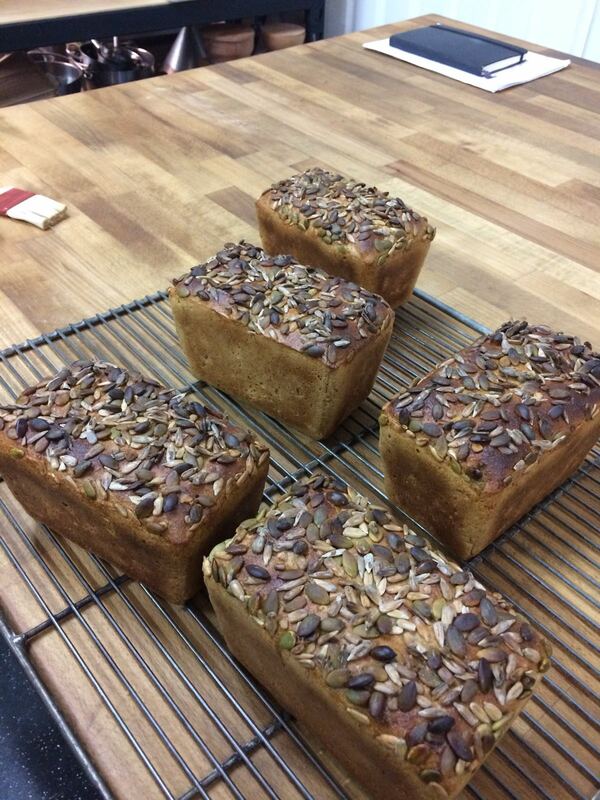 The rye bread process is more familiar to us, starting with a dry mix of rye flours with the added crunch of sunflower and pumpkin seeds folded into the dough. In between folding our dough and leaving it to rest, we drink tea and decide whether to wait for our practice loaves to bake in the bread ovens here or take them home in their proving baskets. The long journey home for some will interfere with the slow rising process, so we wait, allowing the rhythms of the bread to set the tone of our morning. Razieh shows us pictures of the celebration cakes she used to make with her daughter with handmade iced roses, and the conversation turns to the food we miss from our past lives. For Fatimah, it’s the bakeries serving hot bread on every street corner in Iran, or the honey from the mountains, where her uncle’s bees collect pollen from the barberry trees. She remembers him carefully packaging a mother bee into a matchbox to give to a neighbour. The smell of figs, melon, pomegranates and cucumber growing abundantly – you can taste the sun in the fruit. Loveth remembers a dish of yams, catfish and rice, served with a porridge – much like the one we used in the bread recipe today being served at water festivals throughout the Delta in Nigeria. Water spirits were brought to life in masks depicting alligators. The live catfish, brought home by her father still swimming in a bucket, would bite her hands as she tried to catch them – this was all part of the fun. She believes this city is a fruitful place full of opportunities, but initially without the access to knowledge, resources and the connections needed to navigate a new place and a new language she felt completely at sea. 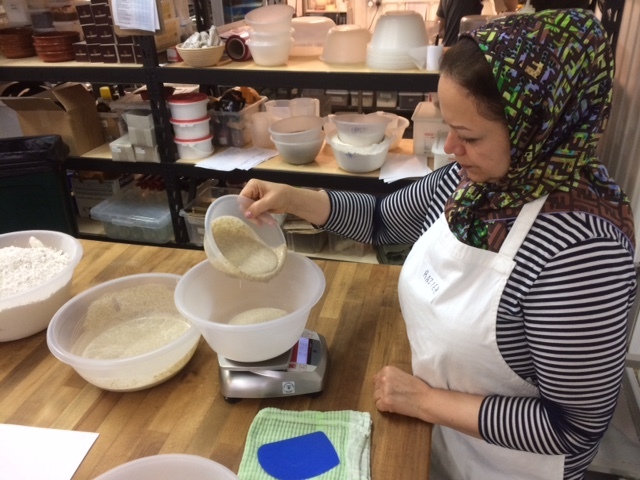 As baker Lizzie shows us how to slash a cross in the tops of our loaves with a razor blade, she reminds us that E5 Bakehouse’s enterprise began in a small home kitchen and our conversation turns from where we came from to where we are going. Our aims are similar: to be part of a community outside home life and family, to grow vegetables in a garden, to learn business skills, to create a space for making and selling soup and sandwiches, like the organic soup we eat every week here on the training course. So E5 started with sourdough, we are starting here.